It’s one of the challenges that all iPhone owners face. The battery can’t be swapped out or replaced, so if you’re out and about and your battery is low, there’s no choice but to carry a charger in your pocket and find an outlet. I have asked for a specific table at a restaurant just so I could be near an outlet and I’ve sat on the floor of more than a few convention centers, listening to a panel and charging my iPhone. I’m happy to say that those days are behind me now that I have the Mophie Juice Pack Plus. 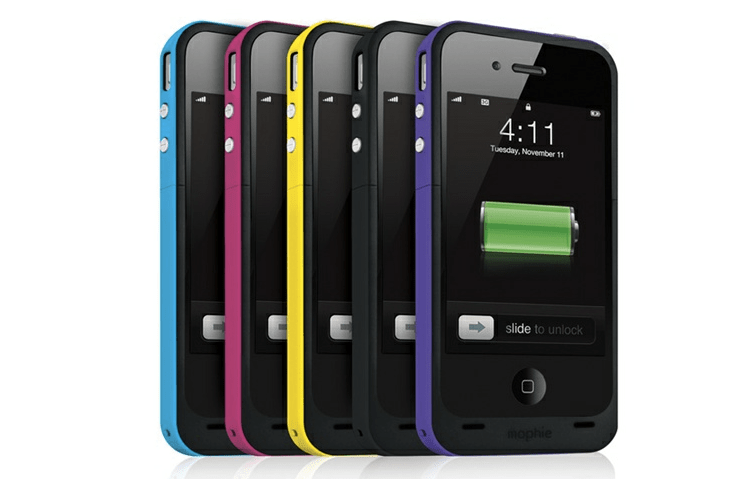 The Mophie is both a case and a battery. And since it doesn’t need to be constantly switched on, you can leave it on your phone all the time, just like any other case. It comes in a variety of colors and doesn’t add a lot of weight to your phone, coming in at just 2.5 oz. Yes, there is additional weight and it’s a bit larger, but it’s a heck of a lot easier than carrying a tangled charger in your bag. The case is a two-piece hard shell that you slide your phone into so that the charging port slips right over the jack in the case. That’s all you need to do. You can still access the on/off, volume and camera buttons and there’s nothing covering the glass front so there’s no interference with the touch sensitivity of your phone. It performs just like normal. To turn the Mophie from a case into an extra battery, there’s a small toggle on the bottom corner that you switch. You know it’s working because you’ll see the little battery icon indicate that your phone is charging. There is also a silver button on the bottom of the case that you can press to see how much life is left in the extra battery via a display of four little white lights. There is a USB cable provided with your case that plugs into the side of the Mophie and can recharge the Mophie, your phone, or even sync your phone. You just connect the other end directly to a PC or the standard iPhone wall-plug adapter. The battery is good for 500 full charges, which means from 100% down to nothing. You can top off the battery and it doesn’t reduce the number of full charges. Top it off 10% and you’ve still got 90% to go before you’ve used that one charge. The only functionality issue I had was in using the camera. It’s fine in almost any situation, but when you use the flash the image is overexposed from the reflection of the flash against the lens opening of the case. It’s a small problem, and doesn’t affect the camera at all when you’re taking photos without the flash. I tested the Mophie Juice Pack Plus ($99.95) which is designed to more than double the life of your phone. The manufacturer’s specs indicate that you can expect the following. In my average day-to-day phone usage, I usually make it until late at night before my battery starts getting low. I found that when I used the Mophie on my nearly dead phone that I got comparable usage. It wasn’t an exact science, but it felt like it was in line with their specs and would more than suffice to get you through a day of unexpectedly high usage without having to stop and charge. In addition to providing me with the Juice Pack Plus, Mophie also sent an Outdoor Edition ($119.95) . This only comes in orange and it includes a one-year subscription to the Mophie-Outdoor app bundle that turns your phone into a GPS receiver and offers thousands of downloadable, trail level maps. You can track and record your speed, distance and elevation and even send updates directly to Facebook. If you often find yourself in a situation where your iPhone is running out of juice, then consider getting a Mophie Juice Pack and stop worrying about charging your phone. hi Nicole … I have one of those and I agree with you and this case was one of the best case that up to now I have.